Results for Product Code "P519HL"
Project clear, Full HD images up to 300"—ideal for medium to large spaces, such as a conference room or classroom. With no replacement bulbs to worry about, and no warmup or cooldown time, laser projection can save you time and headache. It can run 24/7 and has low power consumption, making it perfect for use in demanding environments. Enjoy bright, vibrant colors the way they were meant to be seen, with 93% sRGB color. Laser technology lasts up to 10 years—20,000 hours or 8 full hours of use each workday. Plus, the IP5X dust rating means your projector works beautifully even in tough, dusty environments. Any angle, anytime: The P519HL is engineered to project perfectly—even on its side or upside down. 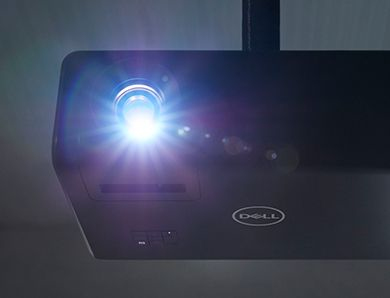 Seamless transitions: Your guests can present easily using the Dell Network Projection App Lite, which can be run without installation and can accommodate up to four presenters simultaneously. Ports galore: The wide range of ports allows for easy connectivity to devices and network control systems. Seamless management: The RJ45 & RS232 allow you to conveniently control your projector via the network or meeting room control systems.